The Model 775 Slimline Open-Top Triple Magazine Pouch from Safariland is designed to take up as little space as possible on duty belts. The well-sized pouch fits three magazines into the space normally taken up by an ordinary dual magazine holder thanks to its face-out orientation. It is crafted from rugged, SafariLaminate and comes in a plain, gloss or basketweave finish. The open-top design allows shooters to rapidly retrieve space mags, dramatically speeding up reload times. Retention screws between the pouches allows users to custom set ideal levels of security. 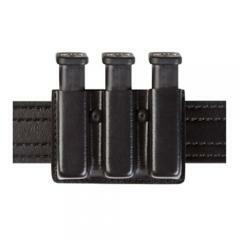 The pouch comes with horizontal and vertical belt slots for versatile carry and fits a 2.25-inch duty belt. Material is great fits mags well but like other reviews the retention for the magazine is not the same for all three magazines. Fits good and adjust good for tightness on the magazines. Deputy Sheriff from Kentucky purchased the high gloss and works great with my G22 mags. Love my triple mag pouch fits easily on my duty belt and does not move around I highly recommend buying from cops plus. Very good quality quality materials and workmanship. Able to carry an extra magazine in about the same space as a traditional twin magazine pouch, which is a real plus in these trying times. Easy to use, fast mag reloads, and robust. One extra mag? Gotta have it in these times. Great mag holster. Fits vertically in the same space as a double. I love my extra mag pouch. Holds my mags really well and it feels better than the closed top pouches. Overall great product. I was carrying a third magazine in my pocket. Glad I have them all on my belt now and it takes up just a hair more length than the standard common double mag pouch. Three magazines replace the space of two. Fits very well on my duty belt. Great pouch. Adjustable so mags are not loose. Enjoy wearing it. Holds the magazines in good yet able to get one out quickly. Plus it just looks intimidating I think haha. Xd 45 mags fit well. Handy, easy way to carry extra mags on duty belt, after a while the pouch start sagging a little, maybe they can re-engineer the way its affixed to the duty belt? Most of the officers I know carry this arrangement. So far, good product. Magazines little tight getting into n out of holder, but I like the product. Does this fit a civilian belt also, or just a police uniform belt? Fits 2.25" wide duty belts. Will this fit my magazines? I have a H&K model 40 usp standard? Select "H&K USP .40" from the Gun drop down menu. Yes - Select "Sig Sauer P320 Full Size .45" as the fit. Will magazines from a smith & Wesson mp 40 cal. Fit in this item? It should fit if you select "Smith & Wesson Sigma 9mm". Will this holder fit my high cap (15 Rd) .40 cal Glock magazines? Yes it will fit high capacity magazines because this is an open top magazine case.